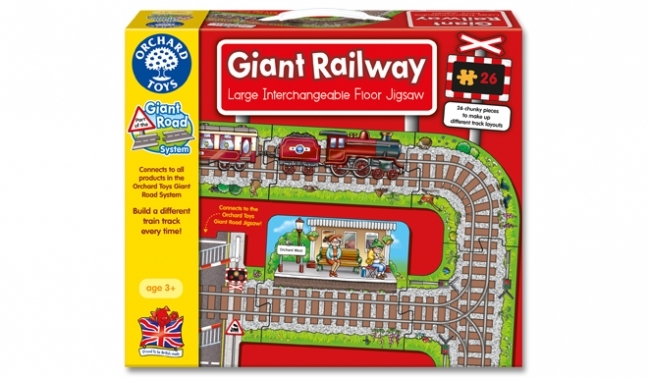 Orchard Toys have some brilliant new products for 2016 and one of these was the Giant Railway Floor Jigsaw. Like most little boys, Elliot is fascinated with trains so I knew he'd love this. And when Orchard Toys offered us the chance to review it, we jumped at the chance! 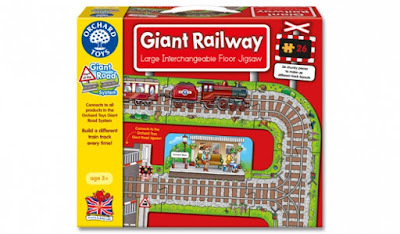 Like the rest of the range, the Giant Railway floor puzzle comes in bright colourful packaging and you automatically know it's Orchard Toys. The puzzle contains 26 large chunky pieces, including two stand up trains, a couple of workmen and a cow! The puzzle pieces are interchangeable which means you can make a different track each time. One of the best things about the Giant Railway is that it can be used with the other products in the Giant Road system. 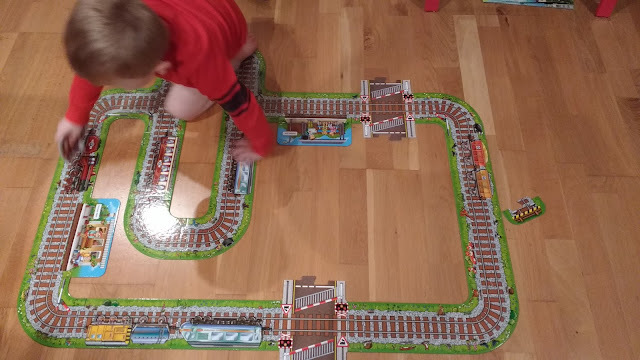 Elliot was given the Giant Road puzzle for Christmas and so he has been able to link this up with the tracks. This has given him hours of entertainment, especially when he bought down a load of cars, animals and people to incorporate into the game. At one point we even had dinosaurs on the track! Orchard Toys also have a Giant Town which interlinks with the track and road so I'm definitely going to be purchasing this soon. This is a great addition to the Orchard Toys range and I know that it will continue to be a popular choice for Elliot to play with! This looks fab and definitely something my youngest would love! This looks like a lot of toy for a good price. My son used to love all things railway.